Paula Wolfert surrounded by her beloved clay pots in her Sonoma kitchen. Photo © Eric Wolfinger. 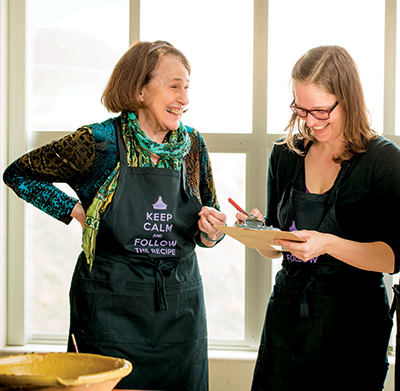 The cruelest irony of Paula Wolfert’s Alzheimer’s disease is that her 79 years have been marked by enough unforgettable experiences to fill five lifetimes. While not a household name, Wolfert was the globetrotting culinary adventurer largely responsible for bringing couscous and other Middle Eastern staples to American kitchens. Today, she finds herself in a race against the clock to document decades packed end to end with indelible memories. ​Enter Emily Kaiser Thelin, who stepped up to become her mentor’s memory keeper. Thelin first met Wolfert in 2008 while on assignment for Food & Wine magazine in Morocco. Together, the two women wound their way through Marrakesh’s ancient marketplace. ​It was the start of a friendship that deepened when, in 2010, Thelin and her then-fiancé relocated from New York to Northern California, just as Wolfert and her second husband, William Bayer, a crime novelist, had done several years earlier. ​Thelin’s move westward coincided with Wolfert’s initial suspicion that her brain wasn’t firing on all cylinders. By 2012, she could no longer hand-roll couscous—something she had done thousands of times—or remember how to make an omelet for her husband in their Sonoma home. In 2013, Wolfert received a diagnosis of stage 4 probable Alzheimer’s. Her short-term memory began slipping away first; over time, basic functions and long-term recollection would be compromised. ​“I wanted to get her memories down while she still had them,” said Thelin, who suggested Wolfert collaborate with her on a cookbook that would serve as a capstone to nine masterworks that include Mediterranean Cooking and Couscous and Other Good Food from Morocco . ​“It amazes me how few people know who she is, and that makes me angry,” said Thelin. A dozen publishers passed on Thelin’s book idea, but she pushed ahead with her plans via a Kickstarter campaign, partnering with a team of crack food world professionals willing to work on drastically reduced budgets. The campaign easily raised over $90,000 from some 1,100 contributors—doubling its $45,000 goal. In late 2016, Unforgettable: The Bold Flavors of Paula Wolfert’s Renegade Life was released to great acclaim. Poring over Thelin’s loving, insightful text, Wolfert’s delicious recipes and renowned food photographer Eric Wolfinger’s images, it’s hard to understand how any publisher had declined to acquire it. ​The story begins with young Paula (née Harris) born into a middle-class Jewish family in the Flatbush section of Brooklyn, N.Y. Wolfert clashed with her mother, Frieda, a looks-obsessed housewife who put her young daughter on diets of cottage cheese and lettuce from an early age. 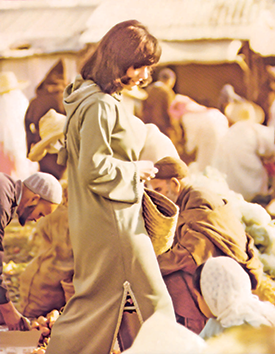 Wolfert shopping in a Tangiers market in the early 1970s. ​Her years in Morocco expanded Wolfert’s view of world cuisine beyond her French training. By cooking with women all over the country—from maids to wives of dignitaries—she acquired an impressive expertise in Moroccan food. Today, immersive cookbooks supported by meticulous research and days spent with ethnic home cooks are common, but when Wolfert started, she was in the rare company of women like Indian-born food personality Madhur Jaffrey and Egyptian-born Claudia Roden, a leading Jewish food writer perhaps best-known for The Book of Jewish Food. ​“Paula’s legacy endures because she can be trusted when she interprets traditional classical dishes—and they work,” Roden said via email from her home in London. ​Throughout her career, Wolfert presaged many trends, including a focus on healthy grains, regional French cooking, appreciation for slow-cooked dishes and a love of foraging for seasonal greens—something she did in Israel in the 1990s. ​“I take a lot of journalists and others around who know about cooking, but no one matched her,” recalled Moshe Basson, executive chef and owner of Eucalyptus restaurant in Jerusalem, who organized Wolfert’s foraging excursion in the hills outside the Holy City. Basson, Wolfert and company put together a spontaneous picnic, sautéing the greens they had gathered with olive oil and white wine. Wolfert and Emily Kaiser Thelin. Photo © Eric Wolfinger. ​The Unforgettable Kickstarter project was such a resounding success—several thousand finished copies of the book were shipped to those who had donated a specified amount—that Grand Central Publishing reissued the book in October with a new forward by superstar chef Alice Waters. ​These days, Wolfert is focused on preserving her mind. Unforgettable’s final pages contain a primer on the research between memory retention and diet. There’s even a section on the connection between flavor and memory, which suggests ways to expand our ideas on how to taste food. Wolfert has taken up meditation, exercise and intermittent fasting, all of which she believes slow the growth of harmful proteins on her brain. She also starts most days with a homemade version of so-called bulletproof coffee fortified with clarified butter. ​ “Since my diagnosis, I’ve had to focus all my energies on my health,” Wolfert said via email. “Because dementia has diminished my palate, I have moved on from my life in food.” A painfully stark admission from a woman once considered to have the best palate in the business, according to prominent food writer and critic Ruth Reichl. ​Today, Wolfert eschews gluten, dairy and sugar whenever possible. Instead, she favors meat and seafood enriched with omega-3 fatty acids as well as nuts, avocados and berries—all considered beneficial for heart and brain health. She also takes advantage of medical marijuana to help her sleep seven to nine hours a night. ​“As my grandmother often told me, you can’t win a war unless you’re willing to fight,” said Wolfert. “I don’t expect my diet to cure me, but I think it has helped me stabilize. pot cooking, but you can use a small roasting pan. And she first learned to make this chickpea-ringed Deconstructed Hummus in Israel in the 1990s. Adeena Sussman is a cookbook author and recipe developer based in New York City and Tel Aviv. Her latest cookbook is Short Stack’s Tahini . 1. If using soaked dried chickpeas, drain the chickpeas, rinse and place in a saucepan. Add water to cover by 1 inch and a few pinches of salt and bring to a boil over high heat. Lower the heat to medium and simmer, uncovered, until tender, 45 minutes to 1 hour. Drain the chickpeas and let cool until they can be handled. If using canned chickpeas, drain and rinse. Whether using cooked or canned chickpeas, rub them to slip off the skins. Do your best. Not every chickpea needs to be peeled. 2. Using a mortar and pestle, the back of a heavy knife and a cutting board, or a mini food processor, crush together the garlic and 2 or 3 pinches of salt, forming a paste. In a food processor, combine the tahini, 1/4 cup of the lemon juice and 1/2 teaspoon of the garlic paste and process until smooth. With the motor running, drizzle in the ice water, 1 tablespoon at a time, and process until the mixture is the consistency of mayonnaise. Transfer the sauce to a bowl and gently fold in all but 1 tablespoon of the parsley. Set aside 1/4 teaspoon of the garlic paste for adding to the chickpeas and use the remainder to season the sauce if needed. Let the sauce stand at room temperature for 1 hour to mellow and develop flavor. 3. Shortly before serving, in another bowl, toss the peeled chickpeas with the reserved 1/4 teaspoon crushed garlic paste, the remaining 1 tablespoon lemon juice, half of the chile and the olive oil. Season with salt and black pepper, then taste and adjust with any remaining garlic paste or chile if needed. 4. 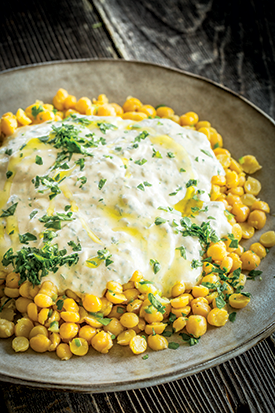 Arrange the chickpeas on a shallow serving dish and spread the sauce on top. Garnish with the remaining 1 tablespoon parsley and a drizzle of olive oil. Serve with pita triangles. 1. Position an oven rack in the lower third of the oven and a second rack in the upper third. Preheat the oven to between 225° and 275°. Grease a thin sheet pan with olive oil. 3. 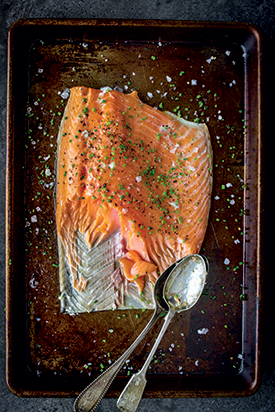 Transfer the salmon to a platter or one or more individual plates and season with more salt and pepper, if desired. Sprinkle with chives, if using, and serve. 1. Preheat the oven to 350°. In a small bowl, combine the raisins with warm water to cover and let stand until plump, about 10 minutes. Drain and reserve. 2. Meanwhile, in a 10- to 12-inch cazuela clay pot, roasting pan or ovenproof frying pan, heat the olive oil over medium-low heat, using a heat diffuser (known as a blech in kosher kitchens) if using a cazuela. Add the cauliflower and sugar (if using) and cook, stirring, until the cauliflower starts to soften, about 10 minutes. Raise the heat to medium and cook until the cauliflower is lightly browned, about 5 minutes longer. Stir in the tomatoes and red pepper flakes, season with salt and black pepper, and cook until the tomatoes have begun to soften, about 5 minutes. 3. Add the raisins, hot water, pine nuts and garlic to the cauliflower and stir well. Transfer to the oven and bake the cauliflower until very tender when pierced with a knife, about 30 minutes. 4. Remove from the oven, stir in the parsley and lemon juice, and let stand at room temperature for 30 minutes. Serve warm. 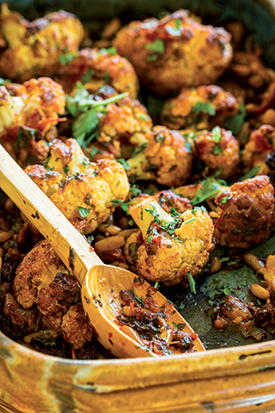 Recipes and photographs excerpted from Unforgettable: The Bold Flavors of Paula Wolfert’s Renegade Life by Emily Kaiser Thelin. Copyright © 2017 by Emily Kaiser Thelin. Photographs copyright © 2017 by Eric Wolfinger. Reprinted with permission from Grand Central Life & Style. All rights reserved. Love her recipes; can’t wait to make them. Will be getting the two books I don’t have. “Unforgettable” is displayed in the Oaktown Spice Shop. Would like to add to my previous comment. 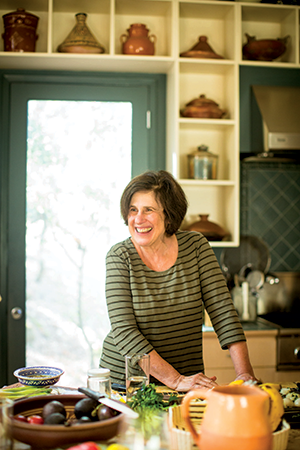 In addition to Fabulous recipes,Paula Wolfert is a wonderful inspiration. The book is an engaging read.